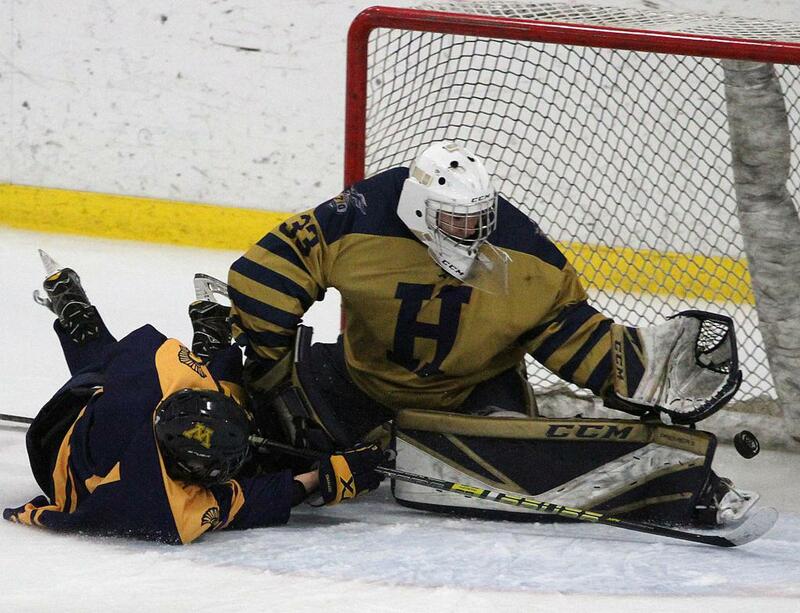 Saturday afternoon had all the makings of a trap game for Hermantown. On the road against a ranked metro team inspired by the hometown crowd marking a special weekend in celebration of its own hockey heritage, the Hawks, ranked No. 1 in the Class 1A coaches’ poll, managed to fight back from a deficit and capitalize on scarce chances. Hermantown is learning how to handle everyone’s best shot. The Hawks (15-3-1, 3-0-0) built a significant advantage in shots and zone time, but didn’t hold a lead until the game ended on a wrist shot from sophomore forward Joey Pierce about four minutes into the overtime session to give Hermantown the 2-1 victory over No. 6-1A Mahtomedi. Hermantown hasn't lost a game in the new year, and continues into February with a favorable schedule to secure a top seed in the upcoming Class 1A, Section 7 tournament. But with the meat of the schedule behind them, the Hawks needed this kind of contest in hopes of exposing and drawing attention to things to work on before the tournament arrived. Mahtomedi (15-4-1, 6-2-1) did an effective job of filling that need as the Zephyrs controlled large stretches of the game despite controlling the puck less. The Zephyrs used spacing to keep a lid on Hermantown early, and used a passive forecheck and set up a neutral zone spread out like a trap. “They did a real nice job of making it difficult for us to get to the net,” Andrews said. Shifting gears and applying new methods on the fly is the mark of any successful team, and Hermantown rolled through its remedies, and found one before it was too late. In net, senior Cole Manahan served as a steadying presence, turning aside three odd-man rushes en route to stopping 28 shots to pick up his 14th victory of the season. A win like this, earned as it was, is just the right thing for Hawks still learning how to win. Paying the physical price to takeover the right spots became an apparent need. Pierce helped set up the first goal for Hermantown by Sam High that pulled the Hawks with 10:17 left in the third, then finished the game with a sudden-death score. In the extra session, Justin Thomas collected the puck in the corner and passed it Blake Biondi in the near circle. Biondi feed the puck across ice to Pierce, who was in position to shoot or pass. 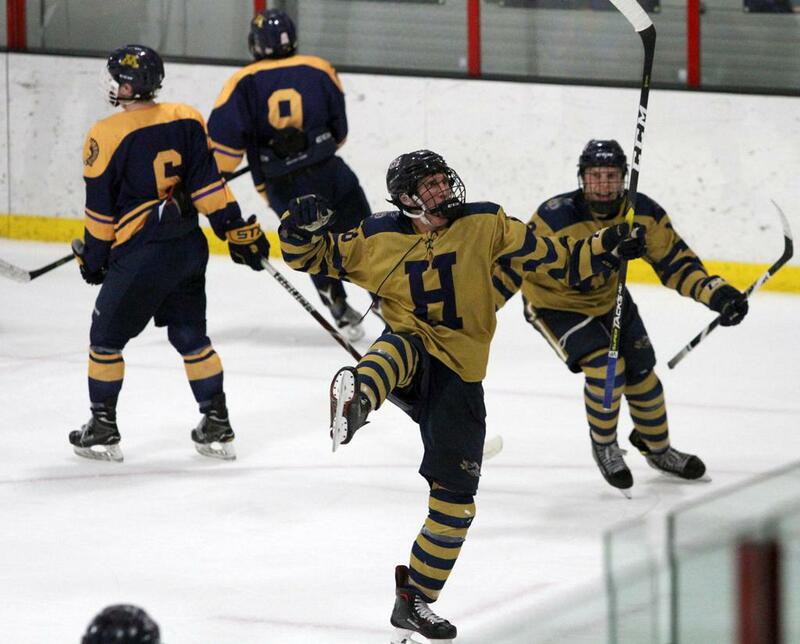 Sophomore forward Joey Pierce unleashed a wrist shot from the left circle that floated into the far top shelf in overtime Saturday to help lift Hermantown to a 2-1 victory over Mahtomedi at St. Croix Valley Rec Center in Stillwater. After a strong but scoreless first period, Hermantown fell behind in the second when Dylan L’Allier scored for Mahtomedi 7:11 into the period. The Hawks, ranked No. 1 in Class 1A in the state coaches’ poll, kept hammering wood and held a significant advantage in shots and zone time. With 10:57 left in regulation, defenseman Sam High scored the equalizer during a scrum in front of the net, and with it, lifted a collective weight from Hermantown’s shoulders. In the overtime session, Pierce received a cross-ice pass from teammate Blake Biondi, took his time, then let the wrist shot go to lift the Hawks to a win that improves their record to 15-3-1. No. 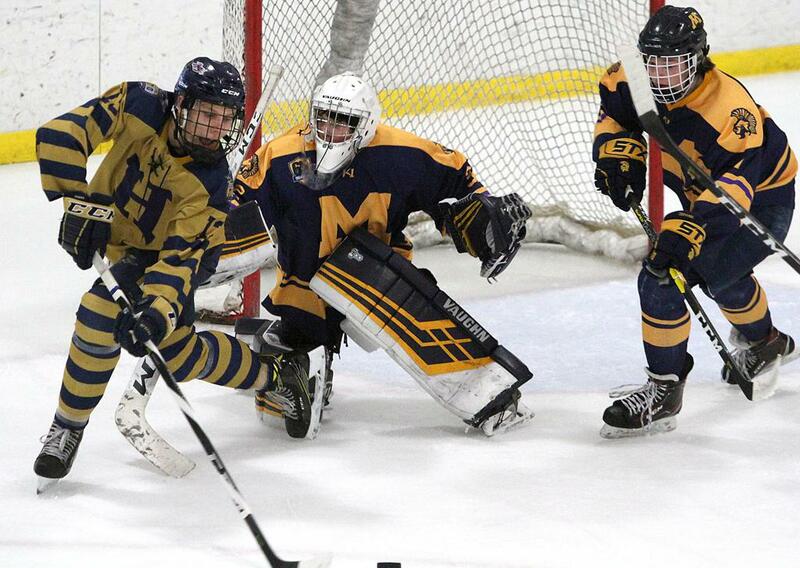 6-1A-ranked Mahtomedi (15-4-1, 6-2-1) received outstanding play in net from freshman Ben Dardis, who turned away 38 shots in defeat. 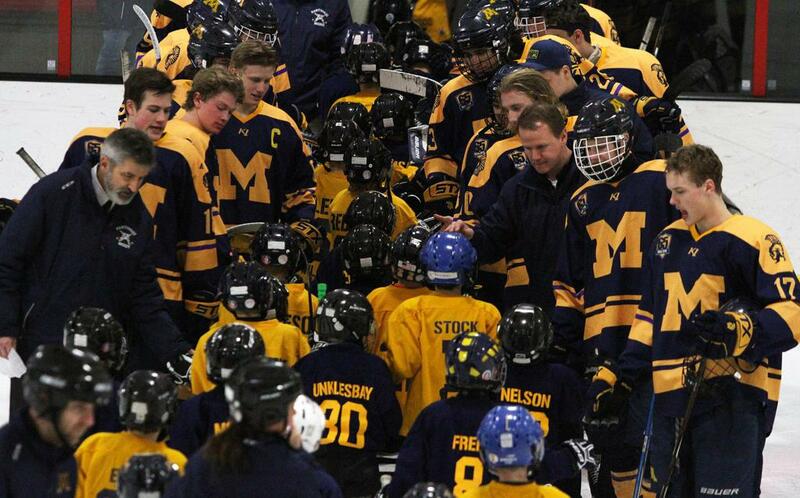 Mahtomedi players and coaches greeted mites players during the first intermission Saturday. The Zephyrs program is celebrating 65 years this week.